could this be your "Timeless Moment"...? Algarve yacht charters and luxury cruises from Vilamoura in the Central Algarve region of Portugal. Making every moment truly special. Timeless Moments - The number one Algarve Yacht Charter specialists. Based in the Award winning Vilamoura Marina in the central Algarve region of Portugal, Timeless Moments strive to create special memories and help you truly make the most of your holiday experiences. Vilamoura is the largest marina in Portugal and ideally located as a yacht charter departure point boasting sailing and motor yacht charters of all types and offering shared or private charter experiences. Vilamoura is the largest purpose built tourist resort in Portugal and as such has created a focal point of the Marina which is surrounded by a vast array of restaurants, bars and nightlife. If you are in the Algarve you simply must include Vilamoura on your itinerary. Vilamoura Luxury Cruises and Private Yacht Charters offer the ultimate in holiday luxury and at Timeless Moments we will work with you to build the perfect Algarve coastline cruise. The Algarve coastline is breathtakingly beautiful as you will see sailing east or west and exploring the unique character and biodiversity from the Spanish border to the Algarve´s most westerly point "Cabo do São Vicente". Sailing east from Vilamoura you will see the coastline offering long sandy beaches with smooth undulating hills as the backdrop. Cruising further we can enter the Ria Formosa nature reserve famous for the inlets and islands that you may see as you fly into faro airport. The park is a national treasure and a haven for wildlife, the pace of life is relaxed and islands such as Ilha do Farol, Culatra and Ilha de Armona give you a real taste of island life. One of our favourite destinations for luxury yacht charters from Vilamoura has been Ilha do Barreta (Deserta) and a restaurant called Estamine that is totally unique in its stunning location. The area was best described in a quote by Harriet O´Brien of the Independent newspaper "A tour to Ilha Deserta in the Ria Formosa Natural Park wetlands is a breathtaking experience. You pass along shimmering channels between sandy islets and you can see species of bird and plants found nowhere else." Here we offer full day luxury yacht charter options to the eastern Algarve stopping at Estamine for lunch. If your choice for the private yacht charter is more west than east then you can expect to see a more rugged coastline typified by secret beaches accessible only by sea, coves, sea caves and grottoes. All this with the Algarvian coastal cliffs as the backdrop. The scenery, the colours and the wildlife are totally invigorating and best enjoyed with some fine wines aboard a luxury yacht charter sailing from Vilamoura. Luxury Cruises and Yacht Charters in the Algarve. The coastline, as we have established, is something that you truly must see first hand, that is a given. The next choice is simply how you choose to ride, or rather sail, to get the most from the trip. Luxury cruises from Vilamoura or anywhere in the Algarve are typified by being a Private Yacht Charter so essentially the yacht is exclusively for your group alone. This compares to regular day charter where people by tickets and you share the experience, both can have a plus or minus. The Algarve luxury yacht charters that we operate and our partners that we work with all strive to bring you a VIP experience, we want you to relax and enjoy your day with us as we spoil you with Champagne, fine wines, tapas and our experienced crew who are there to guide you throughout the journey. 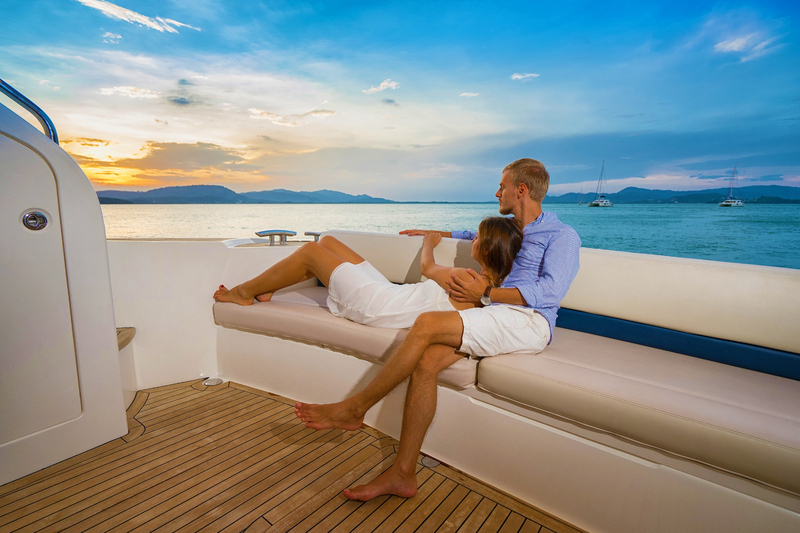 Luxury Cruises - staying connected. We understand how precious is can be to capture and share memories as they are made, going "live" with Timeless Moments Luxury Cruises is now easier than ever. WIFI onboard as a standard and Bluetooth for you to set the mood as you please with your own playlists. We truly care about the experience and not just the trip. We also offer our services for "Bluesky Conferencing". Luxury Yacht hire in the Algarve is perfect for conferencing and offers a unique "out of the box" location for corporate entertainment and hospitality. We can combine air balloon rides, scenic flights, luxury yacht charters and a host of other wonderful moments to guarantee you the most productive of corporate events. Timeless Moments are very proud to bring you the wonders of this stunning part of the world flavoured with a twist of luxury. Life always looks better from a thee deck of a yacht.